Which is better: Doritos or Mountain Dew? It's a question that's plagued philosophers since at least the time of Plato. And now, thanks to Europa Universalis IV, it's a question that's been definitively answered...through science! Yesterday Paradox released the El Dorado expansion for Europa Universalis IV which has all sorts of probably-cool things like new ocean exploration mechanics, legendary cities to discover, et cetera. 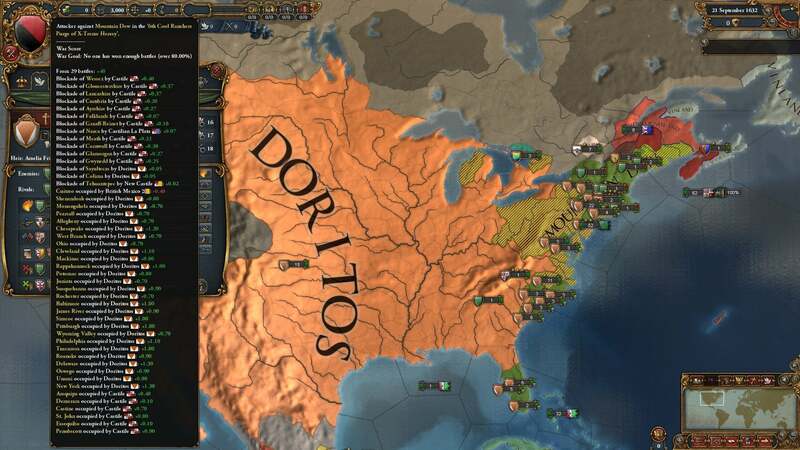 What it also has is a Custom Nation designer. 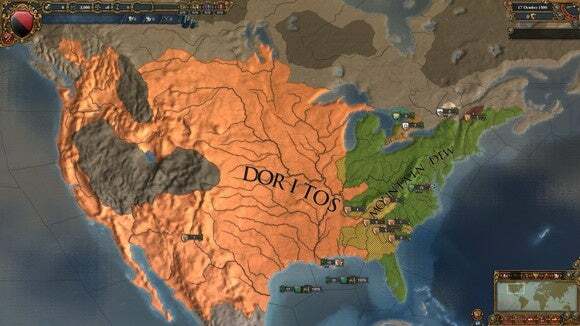 Being a responsible reporter, I immediately used this for the dumbest of ideas: Creating a massive Doritos Empire and a smaller but just as powerful Mountain Dew monarchy, and then making the AI fight itself. 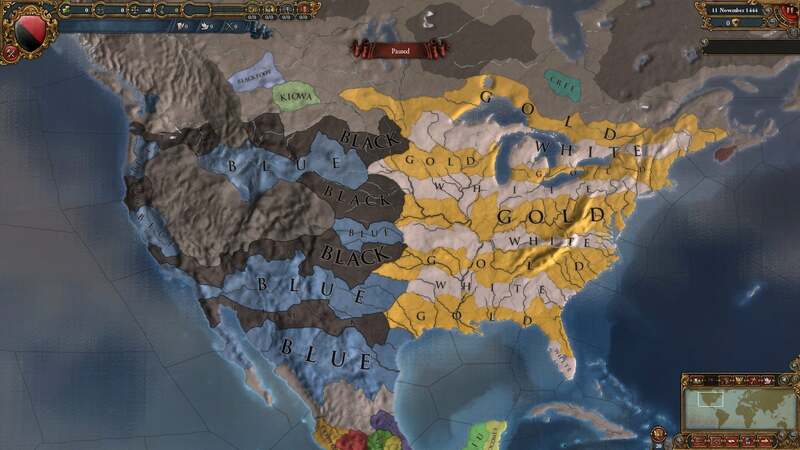 How it works: Custom nations basically work on a point-buy system. 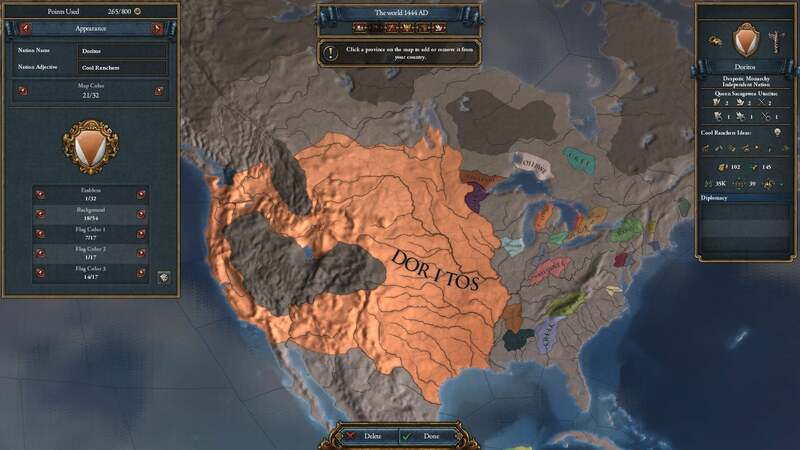 The default "Normal" difficulty represents a nation of 200 points, but in order to take over such massive swathes of the US I set it to the maximum 800 points per nation (Very Easy difficulty). 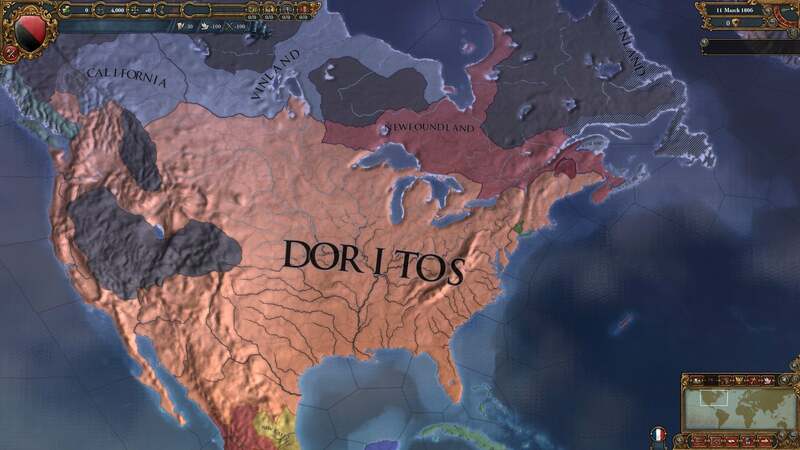 I ended up using 600 points per nation. Most of those were used to buy provinces, which cost a variable amount based on how much they're worth for trade purposes and the like. However, I also set both nations to the Western technology level (150 points) and set each nation's rulers to maximum stats. 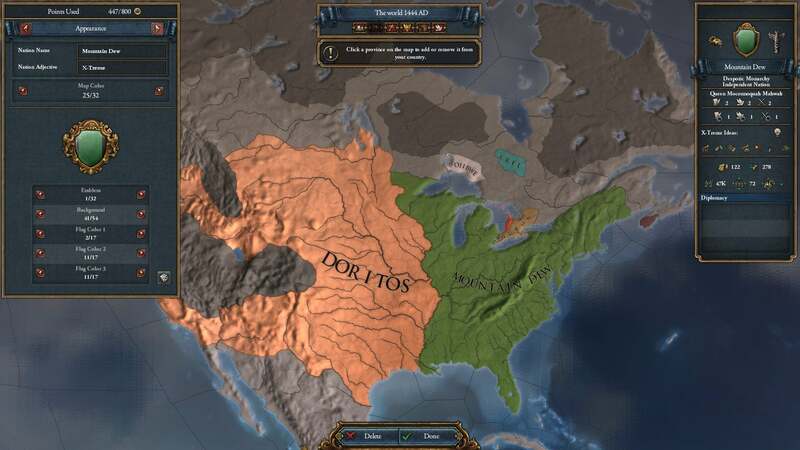 As you can see, the Doritos Empire is far larger than the Mountain Dew elective monarchy. However, this is because the Doritos Empire is made up of the West's massive but low-cost, low-utility provinces, whereas the Mountain Dew nation consists of resource-rich East Coast regions. It's also far easier for the Mountain Dew nation (Dewites) to reinforce their troops because there's less area to cover. So who won? Read on to find out, though I can say this with confidence: No matter what, it's the entire United States that loses. The first decade of this brave new world was quiet. Both nations raised troops as soon as time started moving, but for the most part they seemed content to keep their forces on opposite ends of the map, effectively glaring at each other across the heartland. But not for long. 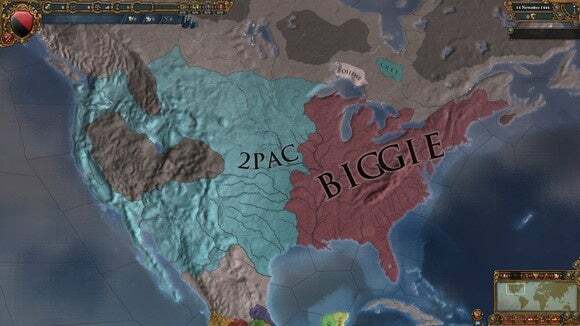 A decade after the founding of each nation, the two came to blows. Suddenly a flood of forces were raised on each side, converging on the border. The ground turned orange with nacho cheese. The rivers ran fluorescent green with the blood of Dewites. Though both nations were charged with maintaining a truce until 1470, each kept a large standing army throughout this period—presumably fearing the duplicitous nature of its junk food rival. Peace did last, however, until 1485—at which point the Dewites rolled almost 100,000 troops into the Doritos Empire. Extreme. All for naught. Once again, an initial Mountain Dew push backfired. The war ended in 1489 with Doritos taking over another swig of land. 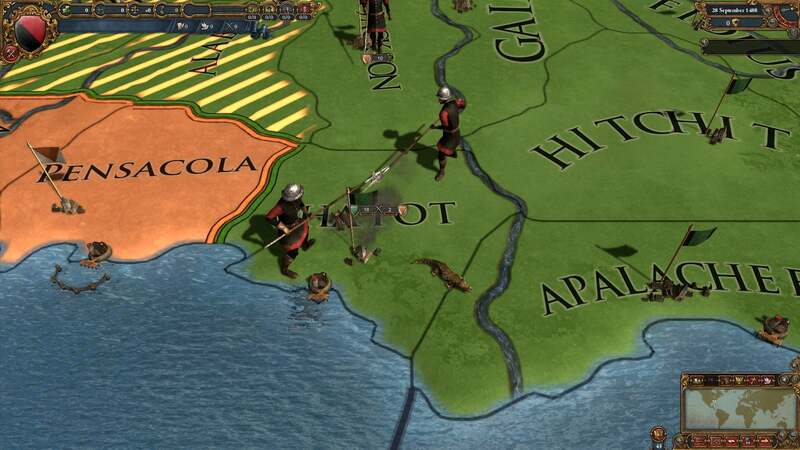 Then things stayed quiet until December of 1502, nearly sixty years after the start of the game. 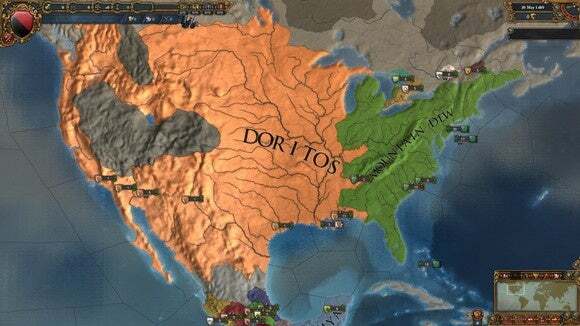 This time it was the Doritos Empire that made the first move, deciding it wanted some of those sweet Florida oranges—presumably because it thought oranges are made of nacho cheese. And when the war ended, a substantial chunk of Mountain Dew land was missing, thanks to strong negotiating on the part of the young 28-year-old Emperor Alexander Frito Lay. 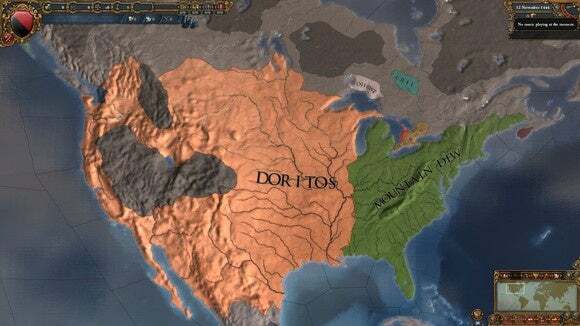 And finally in 1806, just prior to the game ending (time runs out in 1821). You can see that there's still a little piece of Mountain Dew left in Manhattan. Science has spoken! 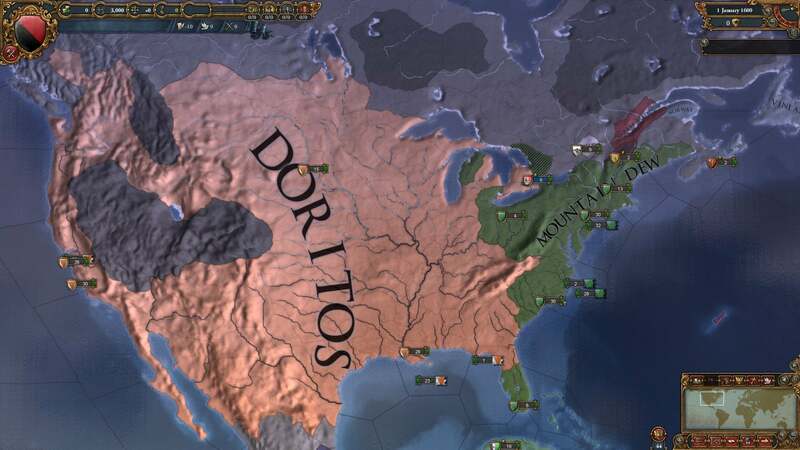 Doritos are the superior snack. When the British needed to be expelled from America in 1776, it was John Hanchip who signed his name with a flourish across the Declaration. Thomas "Cool Ranch" Jefferson who wrote said Declaration. And George "Salsa Verde" Washington who would serve as the Dorito Empire's first president. But this also proves you can't enjoy Doritos without a cool swig of Mountain Dew to wash it down afterwards. 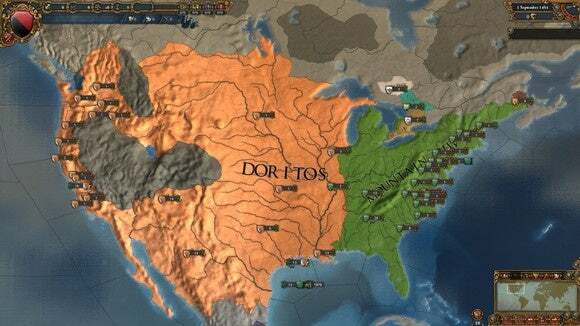 A world without Mountain Dew? Well, nobody would want to live there. 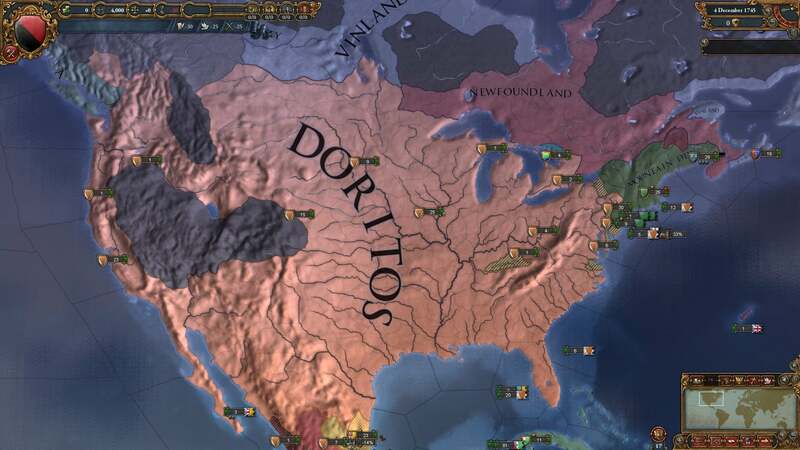 Not even the steadfast citizenry of the Doritos Empire.